(Toledo, OH) Charlie Montoyo’s Durham Bulls didn’t snap a season-long five-game win streak on Friday, but didn’t extend it either. Mother Nature led to a cancellation of the Bulls’ game with Toledo. 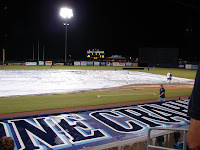 The contest never started, as rain begin at about 7:10, and continued until the game was called at 9:05 p.m.. This was to be the last meeting between Durham (23-19) and Toledo (24-18), so the contest will not be made up. It’s the first Bulls game lost to the schedule since May 18, 2007 at Pawtucket. Toledo, which has won six straight, took the season series, 5-2. The Bulls finished an abbreviated seven-game road trip through Ohio at 2-5, losing the last five contests. The Bulls have scored six runs in the five games, although Durham still led the league in runs scored heading into action on Friday. Durham will try to snap the streak on Saturday when the Bulls open an eight-game home stand against Boston’s top farm team, the Pawtucket Red Sox. Tickets are available at www.durhambulls.com. Either Aneury Rodriguez (2-2) or Richard De Los Santos (2-2) will start. First pitch is at 7:05, and coverage on 620 the Buzz begins at 6:50.